In recent versions of BetaFlight (3.5.1 and above), an idea called “feed forward” was introduced into the PID loop. A simple way to think about Feed Forward is that it’s an interruption to the PID loop. Basically, Feed Forward’s job is to understand “fast stick movement” and push quicker inputs to the front of the PID loop, causing an earlier reaction before waiting for error. Essentially, the faster you move the sticks, the sooner the quad responds to the movement, and the faster it accelerates to that ideal movement. That being said, at full deflection, the RATE of rotation will remain the same, but the drone will achieve that rotation rate sooner if you have feed forward enabled. I just went out and flew with a double FF of 300 on PR, and the feeling that I was experiencing was magnified, which has me intrigued. I’m not sure if this is where I will end up staying, as I think I was starting to see bounceback (as if I had too high of a D value), so I might have to lower it back towards 250. That being said, I’ll make a follow up post where I try higher and higher FF values to get the feeling that I want. 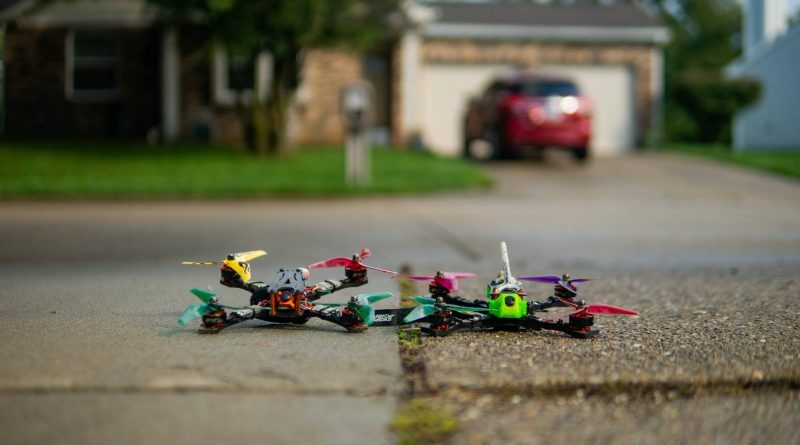 The two quads pictured are two different quads, but they are nearly identical weight and have the same components/props/etc. Only real difference is that one has a Runcam Racer camera, and the other one has a micro runcam swift. This post is NOT Flight One vs Betaflight. In fact, the reason that I’m doing this experiment was because I flew a Flight One quad that had a certain stick feeling that I thought was really impressive, and I’m attempting to recreate that stick feeling with Betaflight, so that I can see how to make it fly fast. Gabby Chaves’ video was what inspired me to start tinkering around with all of this. The two drones were flown with two different radios, but I personally am intimately familiar with both. The RaceFlight drone is flown on my Futaba T18sz, and the second drone was flown on my Taranis 9xD with CRSF. Both have a latency within 1 ms of each other, and I can fly the two radios confidently interchangeably, so the impact that this would have on the test is negligible. The drone that we were using to test Flight One Sim Mode had a vtx issue most of the way through our testing phase, so some data is missing, but I believe that enough is in place to prove the point. That being said, Chaves’ video was about 3.5 vs Sim Mode, but that’s not the approach that I’m taking. The drone that was running Betaflight 3.3 was disassembled, and the ONLY thing that was swapped on the drone was that I added a Flight One Board. As an interesting first point to make, simply swapping to Flight One sim mode from that drone improved my time on average by over 1.5 seconds, with a fast lap being 1 second faster than my fastest lap on BF 3.3. With each drone, I flew around 10 batteries, and we gathered data for around 4-5 batteries each. Some less, and some more after some warmup. The drones were not always flown back to back, and we often interchanged one drone to the next without a warmup period, to keep me from getting super used to each drone, so as to keep the focus on stick feel, rather than direct familiarity with a given drone. The same drone for test 2 and test 3 were used, and we changed feed forward settings simply by using two PID profiles, which allow us to raise/lower the settings as needed. The control and test 1 were also based on the same drone, but over two days: overnight I swapped the flight controller from a Hobbywing F4 (non G2) to a RaceFlight/FlightOne Revolt. The data that you’ll see shortly will show many more laps on the betaflight 3.5.1 drone, but batteries were flown interchangeably, and when we concluded the test, we continued gathering data on time improvement throughout a course. If you’re interested in watching back to back runs and DVR from the testing, see the following. We used the DVR to get the official timing. All clips were conformed to 29.97 (30 fps drop frame), and then timed based on timestamps within dropframe. The information you’ll see on screen is not, for example, 21.23 seconds, but instead 21 seconds and 23 frames. We convert to frames and seconds at a later step. From the data, you can again see that there is much more information available from the BF 3.5.1 with High FF, and again that’s because the test concluded but we continued gathering data. Skip the last half of the data or so if you want to compare high FF and Flight One directly, but for the sake of this post, it would be a safe assumption to say that high FF and Flight One Sim Mode. The most interesting result to me personally is the difference of averages. FlightOne sim mode and High FF Betaflight both outperformed low FF betaflight and 3.3 betaflight. With the control being established around 23.5 on Betaflight 3.3, all tests were a dramatic improvement above 3.3 whether on Flight One or on Betaflight 3.5.1. 3.5.1 with a high FF performed the best in terms of raw data, but I believe that this is slightly skewed because of a lack of practice and experience with Flight One. 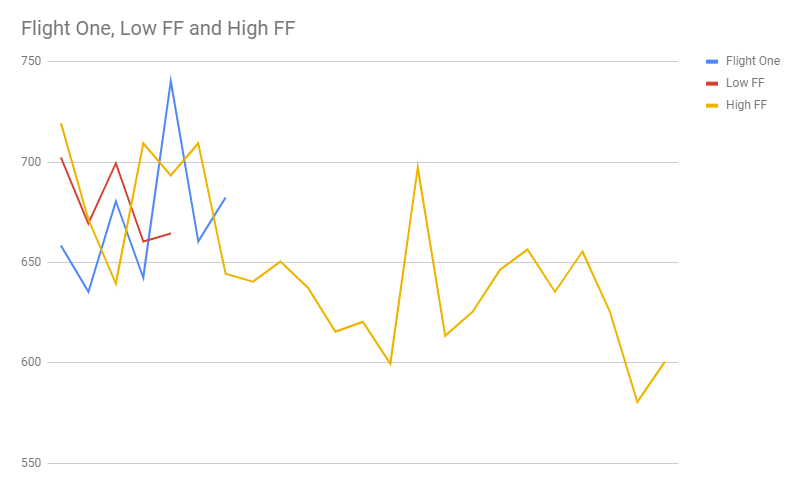 But again, the most important thing is to notice how the difference in STICK FEEL created a faster average score than low FF, and a dramatically better “BEST” time was achieved on both High FF and F1 by a full second. Because I know you’re going to ask for them. 😉 SEE HERE! So if I’m looking at this right, it took you a second, the longest, to get used to high feed forward but once used to it, by far was the best option. That is a perfect understanding. Hi. Thanks a lot for all of this; that’s very interesting. Would you mind share you “freestyle” rates? thanks. Looking forward to watch your next vids. excellent test. Please have the rates for freestyle? Greetings from Argentina!!! !